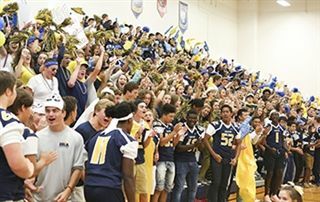 Hampton Roads Academy is the most alive when students are on campus, learning and exploring, making new friends and participating in events. When summertime rolls around, instead of allowing the campus to go quiet, our faculty and staff keep it alive with a robust array of summer camps and programs where students can learn more about their favorite subjects or activities. HRA’s summer camps and programs are available to all current HRA students, as well as students in the community who are not yet Navigators. For non-HRA families considering the school for their students, summer camps are a great way to get an introduction to HRA. Explore the array of HRA Summer Camps and Activities below. Note: HRA's Summer Camp login credentials are different than those used to access the secure portion of the Hampton Roads Academy website. This camp will encompass everything to do with art. Drawing, painting, paper mache, and trips to local art studios. Many field trips planned. Grab your binoculars we are going to take a safari around the world! We will visit different countries each day and learn about native animals through literature, games and art. Discover the thrill of the hunt without leaving camp! Carnival of Animals is a humorous suite of music for two pianos and orchestra by Camille Saint Saeens. Students will get to sing, dance, and imagine themselves as animals while learning all about this French composer and this composition. Students will also learn fundamentals of music including different note values, dynamics, and orchestra instruments through activities and games. Students will also build some instruments to be able to take home at the end of the week. Make your own rustic chalk art signs to take home. Take a look at some projects here: https://www.chalkcouture.com. Each day we will have a new project including a sign for at least three holidays and two everyday signs. Some can include menus, countdowns, or welcome signs. Students get to pick design and style of each sign. All projects will be brought home at the end of the week. • Goodies to take home to share-if they last that long! • Art, games, activities, and so much more Chocolaty FUN! Each child will participate in interactive art projects, learn the history and geography associated with chocolate, experiment with different types of chocolate, learn how to mold, enrobe and combine chocolate with different foods etc. Activities are designed with fun, team dynamics and CHOCOLATE in mind. More fun with chocolate! If you’ve taken Chocolate Camp, or even if you haven’t, you will enjoy doing more challenging things related to chocolate in this camp. Apron or smock recommended. Ballet, Tap, Jazz & Crafts with focus on a classical ballet. Please bring a bag lunch. Snacks provided. Camp held at Yorktown Route 17 Location. Transportation provided to and from camp from HRA. (Bus will leave HRA every day promptly at 8:55am, returning by 2:20pm) Students may remain at HRA until 4pm at no extra charge. Times: 8:30 a.m. - 2:30 p.m.
Have you ever wanted to eat what you make! In this camp we will create wonderful craft creations with edible ingredients. Turn on your creative minds to see what FUN things you can create with food. All supplies will be provided. This is a 3-week camp (must complete all 3 weeks). At the conclusion of this camp there will be a stage performance. Ballet, Tap, Jazz & Crafts with focus on a classical ballet. Please bring a bag lunch. Snacks provided. Camp held at Yorktown Route 17 Location. Transportation provided to and from camp from HRA. (Bus will leave HRA every day promptly at 8:55am, returning by 2:20pm) Students may remain at HRA until 4pm at no extra charge. Everybody loves duct tape as the quick fix for any problem. But….duct tape can also be used to decorate and create things. Students will learn how to manipulate duct tape to create clothing accessories, wallets, bags, decorations and more. Duct tape crafts are great gifts that kids can easily make for friends and family. Spruce up your duct tape collection and impress your friends with your cool new skill. (Duct tape will be provided for the camp, but students may bring special rolls as well). Design your very own fashion line with us Budding designers will keep a fashion portfolio, create a one of a kind piece with recyclable goods and end the week with a Runway Show to rival Fashion Week! We will participate in several design challenges too. Come design the runway with us. Filmmaking camp will walk students through the process of making a film, including storyboarding, script writing, filming, and directing. Each student will get a chance to experience every side of the production of a film and learn about cinematography along the way. By the end of the camp, the students will have made a short film of their own design. Cone and develop your fine motor skills while playing and completing developmentally appropriate activities. Watch their muscles strengthen through lacing, cutting, coloring, stamping, and creating objects out of playdough. Improving fine motor skills will help with handwriting skills, cutting skills, and coloring skills. Food Art, Edible and More! Have you ever wanted to eat what you make! In this camp we will create wonderful craft creations with edible ingredients. Turn on your creative minds to see what FUN things you can create with food. All supplies will be provided. Please indicate any food allergies when registering for this camp. Come and play different games each day that involve whole group – Red Rover, Duck, Duck Goose, Red-Light-Green Light that teach self control and following the rules of play. Small group boards games as well as listening games. This will involve indoor and outdoor games. 5,4,3,2,1 blast off to a galaxy far, far away to learn about Each and the amazing solar system. Discover all things galactic such as comets, planets, shooting stars, rockets and more. Learn about flight, the adventures of space travel, and participate in a rocket launch! Do you have a creative side? Come join in on making instruments. We will use our creative minds to make rain sticks, drums, maracas, and more….. After we make them, we will use them to create beautiful music. We will use our home-made instruments as well as rhythm instruments to have some fun! Learn about everything under the sea! If you love The Little Mermaid then this camp is perfect for you! We will learn all about the ocean, ocean animals, and how to take care of them, make ocean themed art projects, and learn about the fantasy stories of mermaids. Note: This is strictly a dry land camp, no pool time will occur during this camp. Love to do projects but hate the mess? Leave it to us this summer! We will be making different varieties of slime, edible playdo, ocean sensory bags, volcanos, paper mache pinatas, homemade ice cream, feet paintings, and more! Everyday will feature a different topic and projects to take home at the end of the week. Acting/Singing/Dancing. Camp held at Yorktown Route 17 and Dare Road Locations. Bring a bag lunch. Snacks provided. Transportation provided to and from camp from HRA. (Bus will leave HRA every day promptly at 8:55am, returning by 2:20pm) Students may remain at HRA until 4pm at no extra charge. Times: 9 a.m. -2:30 p.m.
Each day is a new day on the farm. With each new day comes a new skill learned on the farm. We will learn what it takes to run a small, homestead farm in one week. Some topics include chickens and egg incubation, gardening, milking and making cheese, basic horse care, animal choices for your farm, and using your resources. This camp could include a trip to our homestead farm in Gloucester. Learn iconic music videos dance moves. Camp held at Yorktown Route 17 Location. Transportation provided to and from camp from HRA. Bus leaves HRA at 9:10 am promptly returning at 2:30 pm. 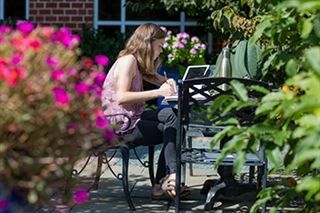 Students may remain at HRA until 4pm at no extra charge. From creating a character, to making it come to life. Students will conceptualize a character, with a story, then, they will design and create the actual puppet, with a variety of fun materials. After puppet making, they will focus their attention on backdrops, props and perhaps even end with an imovie! Open to boys and girls, rising 5th and 6th graders. Get out your magnifying glasses and detective hat as we have clues to decipher and crimes to solve. We'll put our critical thinking skills and STEM knowledge to the test and get to the bottom of mysteries by learning the tricks real investigators use to solve cases. While experimenting with simple detection techniques, your reasoning skills will grow and your problem solving skills will become better than CSI agents. Instructor: Class taught by a staff member from Little Scholars. Yoga camp teaches tools that kids need to help with their on the go life. We use relaxation and breathing techniques along side of physical poses to help strengthen and give self confidence and awareness to the children. They will learn through a series of games, crafts, stories and activities during this 5 day camp. The morning will start with some stretching and relaxation followed by games, activities and crafts. This camp is taught by Ms. Sandi Santiago who is a certified 300hour yoga instructor who specializes in kids yoga. Instructor – Ms. Sandi Santiago - a certified 300hour yoga instructor who specializes in kids yoga. Formerly Jason Borte's The Surf School, Billabong Surf Camp presented by 17th Street surf shop offers the best of Virginia Beach surf camps. You will surf, we guarantee it. The camp operates at the Virginia Beach oceanfront on the beach at 4th street. Our camps are designed for beginners, with a 1:4 instructor/student ratio. Our surf camps are geared towards students between 6-17 years old. Most of our students are standing and riding waves on the first day. For some, it may take a few days. After learning to stand, students will learn to catch waves and perform maneuvers, as well as safety and etiquette. Participants must pack water, sunscreen, towel, snack, lunch and wear swim suit with cover up/shorts, t-shirt, bring signed waiver. Ready, aim . . . . release! Bulls-eye! Archery is a life sport that can challenge and be enjoyed by all ages! Learn the basics of archery mechanics, equipment and skills, improve your shooting form and accuracy, and have fun. Our archery instructors are nationally certified NASP (National Archery in the Schools Program) instructors who are also HRA faculty members. This camp is for all levels of experience and ability. If you know how the pieces move, this is the camp for you! (If you don't, there is still time to learn!) The goal of chess camp is to help players think clearly and logically about solving problems they face on the chess board. Studies have shown that this type of thinking is readily transferred to other areas, both academic and non-academic. Students will follow a curriculum developed by the instructor, Chess Master James Schuyler. Fun may accidentally occur. Each player will receive a chess set and certificate upon completion of the camp. Light physical activity during breaks - dress appropriately. Times: 12:30 - 4 p.m.
Bring your sneakers and let’s break a sweat! Campers will play a variety of sports and activities every day. Must have athletic clothing and sneakers to participate. Some days we will be outside so they will need a hat, sunglasses, sunscreen etc. A water bottle is encouraged. Students will learn the basics of fencing, an Olympic sport that has been passed down for centuries that safely recreates the swordplay of old. Epee’s, foils, or sabres will be provided as well as all safety equipment. Fencing is a safe, fun way to get moving and to learn something new! Get super fit, gain confidence and strength. Ji (Miracle) Qi, former Chinese national team fencer. She began fencing in China at the age of 14, starting with épée and then switched to sabre, and started competing soon after with the Chinese national team. In 2001 she won a bronze medal at the Chinese National Junior Championships, and in 2002 she earned a silver medal as well as the Individual Sportsmanship award. In 2005 she won a silver medal at the Chinese National Championships, and in 2006 & 2007 she was a member of the winning team at the Chinese National Team Championships. She now coaches sabre for multiple clubs, including William & Mary, whom she guided to first place finishes for men's and women's individual and team sabre, helping them win the 2015 Virginia Cup. Campers will be taken to the Miracle Fencing Club on HRA buses. The bus will leave HRA each promptly at 9:30am and return to HRA at 2:30pm. Please pack a lunch and light snack along with your water bottle. Dress in comfortable clothing. Time: 9 a.m. - 2:30 p.m.
Hampton Roads Academy has partnered with Foxtail Farms in Smithfield, Virginia to offer a 5 day camp for campers interested in learning how to ride and care for horses. Campers will receive daily instruction in English Hunt Seat Equitation and learn how to tack and untack a horse (or pony) safely. In addition, campers will learn proper horse care. Daily activities will also include crafts, games, a nutritional science experiment with the horses, painting the ponies to learn the parts of a horse and other horse-related activities. A farrier will demonstrate horse shoeing too. Campers will experience a trail-ride on the Foxtail Farms property and they will get to swim the horses in the river weather permitting. No previous riding experience is required! Campers must bring their own lunch. Campers must wear close-toed shoes with socks and longs pants. Safety helmets will be provided. Mini Horse Show on Friday and campers will have the opportunity for swimming one of the days. Campers will ride HRA buses to and from the farm. If you have tournament experience or previous chess instruction, this is the camp for you! (Approximate USCF rating 300-900). The goal of this camp is to help students develop and improve as chess players. Studies have shown that chess thinking is readily transferred to other areas, both academic and non-academic. Students follow a curriculum developed by Chess Master and instructor James Schuyler. Fun may accidentally occur! Mini-tournament (unrated) on the final day. Each player will receive a chess set and certificate upon completion of the camp. Light physical activity during breaks - dress appropriately. Young campers will get to earn their own Jr. Ranger badge while exploring and discovering all that Yorktown has to offer! Whether at battlegrounds, monuments, nature walks or beaches, campers will be busy all day as they learn all about this amazing area of Virginia. This program, featuring our new state-of-the-art Tree House Challenge Course (30 feet above the Earth! ), is for campers looking for a unique opportunity to challenge themselves both physically and mentally! While building leadership, confidence and communication skills, participants will engage in games, teambuilding activities, creative problem solving, and confidence building obstacles both on the ground and in the air! Learn the basics of Challenge Course safety, equipment, and knot tying, while preparing to soar along our ZipLine or Fly like a Squirrel! All activities are supervised by our well-trained staff who will participate through demonstration and individualized instruction. All staff members are certified annually for all elements in our course and must pass strict examination requirements for certification. Welcome to the world of creative play using the classic LEGO bricks. Playing with LEGOS helps children hone their creativity, develop fine motor and problem solving skills, build teamwork, and unleash their imagination! Whether you are building cars, planes, space stations, robots or your own elaborate construction - your child is free to explore, imagine and create! Motorized versions for those who are ready to move ahead . . .! Come join us for running and fun! In this camp, we will travel to local parks and trails to build fitness and confidence through running. Running form, drills, warm-ups/cool-downs, proper stretching, and strength training will all be integrated throughout the week. This camp is open to rising 6th graders and up. Lace up your running shoes and join us for a week of fun and fitness! Do you LOVE field trips and exploring new places? You will get to see some of the very best museums in the area in one week! Our group will enjoy the sites at each museum and participate in some fun programs planned just for us! Some of the museums we have visited include: VA Sports Hall of Fame, Virginia Aquarium & Marine Science Center, Children's Science Museum of Richmond, the Children's Museum in Portsmouth, Chrysler Museum, Virginia Air and Space Museum, and more! Camp focuses on learning and improving fundamental skills in the game of lacrosse. Skill work includes: throwing, catching, ground balls, shooting, dodging, face-off/draw controls work, goalie development, offense and defense, and rules. Times: 8:30 - 11 a.m.
Campers will learn and participate in a variety of “neighborhood games” such as flag football, wiffle ball, kickball, basketball, four square, capture the flag, and kick the can. Time to put away the screens and have some old fashion fun! Join Hampton Yacht Club for an amazing summer of legendary sailing adventures! This is knot your typical sailing camp. We incorporate sailing with marine science and fun; play on-the-water games like Quidditch, Tennis Ball Tag, Turbo Basketball, Highway and more! Every first Friday we host a Pirate Day, where sailors get to dress like pirates and go on a sailing scavenger hunt to find the pirate treasure. During each session, we will have a Parent Day where parents are encouraged to come watch what their child has learned throughout the camp, and of course take pictures! After completing each course, sailors are sent home with a card showing which goals they have accomplished throughout the course.Campers will start their day at HRA and will travel by HRA bus to the Hampton Yacht Club in Hampton, where the sailing program will take place. Campers will then return by bus to HRA for dismissal to parents or to eat their lunch and take part in our afternoon program. Each camper should be prepared with a bag lunch, water bottle, towel, approved personal flotation device and sunscreen. Water shoes and bathing suits are suggested. More information can be obtained at www.hamptonyc/hycjr.com. A waiver will need to be completed and will be sent to you upon registration. Space is limited! This entry-level class is a one-week long, full day class that introduces sailors to the basics of sailing. This class teaches sailors the basic rigging fundamentals, seamanship, water safety and confidence in sailing all points of sail. Every Thursday, we have a marine science day. This entry-level class is a one-week long, full day program that is for new sailors or for sailors graduating from the Optis or looking to get into high school sailing. This class teaches sailors the basic rigging fundamentals, seamanship (knots and weather), water safety, sportsmanship and confidence in sailing all points of sail. This class will be taught on our new RS Fevas. Players will learn proper form for basic soccer skills including dribbling, passing, juggling, shooting, throw-ins and more. Any skill level is welcome. Basic foot skills and moves will be taught to enhance one-on-one play. Players will practice their skills in daily drills, games and scrimmages. Come learn to play the beautiful game of soccer! These camps will be directed by HRA Varsity Tennis Coach, Marvin Hedgepeth, who, in addition to coaching high school tennis for more than 30 years, has been a certified professional tennis instructor with the Professional Tennis Registry (PTR) since 1988. While beginner and intermediate camps will include physical conditioning, resistance training, and drills, the primary focus of the beginner camps will be learning how to properly execute the serve, forehand, and backhand. The intermediate camps will include more games and supervised play in both singles and doubles. Campers will be divided by level of play. This camp will focus on the fundamentals of volleyball: passing, setting, hitting, serving, rotating, and rules. It will be a great way to learn the game if you are new or to brush up on old skills before preseason begins in the fall. Taught by HRA girls Coach. It is easy to fill a day or two with all of the things to do in Hampton Roads! Will it be a day of mini-golf & arcades . . movies, bowling, or LazerRush? Cruise the waters on the Spirit of Norfolk or catch a fly ball at the Norfolk Tides home game! Something new each day. . . Sign up with a friend and join the fun! Times: 8:30 a.m. – 4 p.m.
Come and take part in this amazing Zumba Dance Camp. Dances styles taught - hip hop, Cumbia, Merengue, salsa, reggaeton, current pop and more. Campers will be exposed to popular Latin artists. Campers will be taught how to do basic choreography and will each get a chance to teach their own son/dance to the group. There will be a performance at the end of the week. Are you interested in learning how to program with computers? Scratch by MIT is an online coding tool that teaches kids to program their own interactive stories, games and animations. Through a simple block-connecting interface, Scratch is a great start for a beginner to start coding. All students will need their own email account before camp starts. Drone Racing is filled with pure action as students enjoy one of the world’s fastest growing sports, Drone Racing. Campers will first learn about the basic safety of drone flying and the history behind drone racing as a sport. From there, campers will progress through various skill challenges and learn how to perform various exercises and maneuvers to become familiar with the drone’s speed and agility. Flight squads post up against one another in friendly competition when they race themselves and the clock. Students first maneuver the drone through creative obstacle courses before taking on the challenge of flying for speed. Participants contribute fully in this program as they create the design and help build the the obstacle course in preparation for the last day’s final activities and competition. All campers go home with interactive workbooks and plenty of Drobots Company keepsakes and trinkets so the memories last long beyond the summer. Drone safety and social responsibilities of flying are included in this program. This camp will include practicing skills to prepare your student for First Grade. We will cover letter identification, letter sounds, letter formation, reading strategies, and word attack skills. We will also engage in writing activities related to literature while covering the book knowledge basics of identifying the author, illustrator, and title as well as describing a story’s beginning, middle, and end. To practice math skills, we will review numeral identification and use manipulatives to complete activities involving number sense, addition, subtraction, and graphing. To prepare your student for Kindergarten, this camp will target lower case and upper case letter identification, sounds, and handwriting formation. We will also practice numeral recognition and basic mathematical skills of sorting, graphing, patterning, counting sets up to 20, addition, and subtraction in a hands on format with manipulatives. Skills will be practiced within the framework of a “Back to School” theme and as extensions to fictional literature selections. This camp will include practicing skills to prepare your student for Second Grade. We will cover basic letter sounds and include blends, digraphs, and vowel teams while practicing reading independence strategies. We will also complete writing activities with an emphasis on recording complete thoughts with capitalization and end marks. For math skills we will review math facts up to 20 with hands on materials and with quick fact recall games. Practice with counting money, telling time, and fractions will also be included. The students will work to develop independent reading fluency and comprehension skills. They will also further develop their writing skills by focusing on details, mechanics, vocabulary, and grammar. The students will review and practice place value skills through hundred thousands; review and practice addition, subtraction, and multiplication facts; review and practice addition and subtraction with regrouping. Classes taught by Mrs. Tina Silberhorn, current 2nd Grade teacher at HRA. Times: 8:30 a.m. - noon OR 12:30 p.m.- 4 p.m. Junior Drone Coders is specifically designed for campers with little to no experience flying drones or coding. Campers will learn the basic principles of how to code drones to fly. To complement the coding aspect of the program, we teach the campers how to utilize basic flight terminology to conquer fun and interactive flight challenges. 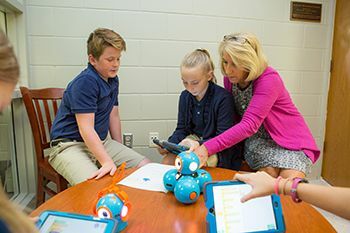 Campers will learn to pitch, yaw, and roll through self-created obstacle courses and then utilize iPads to code the drones through the obstacle courses. All campers go home with interactive workbooks and plenty of Drobots Company keepsakes and trinkets so the memories last long beyond the summer. Drone safety and the social responsibilities of flying drones are included in this program. This camp will review basic grammar concepts, introduce word building skills based on Greek and Latin roots, and practice the skill of reading comprehension. Rising 7th and 8th graders will also have the chance to explore derivatives found across the foreign languages offered at HRA. Please note that this course will only meet for 90 minutes each day and will alternate by grade level with Mrs. Clover’s middle school math camp. Camps taught by Ms. Stacy Ansama, Current HRA Upper School Faculty. ** Please note: This course will only meet for 1 1/2 hours each day and a different time for each grade level (see below). The Little Veterinarian Camp encourages children to explore the exciting world of veterinarians. Using interactive demonstrations, crafts and games, children learn how to take care of a pet and to notice physical issues a pet may be experiencing, how to use instruments that veterinarians use, and what to expect at a veterinarian’s office. For this program, each student will take home his/her own stuffed dog as well as a stuffed kitten at the completion of the camp (which he/she will adopt on the first day and take care of throughout the week). Other take-home materials include a tape measure, dog bone cookie cutter, worksheets, and so much more! Students who successfully complete the program will be granted a graduation diploma, which they will receive during a graduation ceremony on the last day of the camp where parents or guardians are welcome to attend. Use your skills as a creepy chemist to make your own radically gross reactions with batteries, coins, and more! Compare fingerprints and discover the mysteries of DNA as you step into the shoes of a crime scene investigator. Make "brain goo" and get into your “guts” with an introduction to the circulatory, respiratory, digestive systems, and more. Discover cool and yucky chemical reactions in this hands-on science adventure! Build your own programmable robot! Join us for a week of fun with amazing robots! In this week of camp, learn about the uses of robots in our world and spend time experimenting with super cool red-hot robots. Experiment with sound sensing robots, line-tracking robots, amphibious robots and robots that can even play soccer! Discover the science of circuits and how robots use sensors to explore things around them. Use your skills to build your very own working robot to take home with you! Focus on the science of forensics in this hands-on look at crime scenes. Identify and collect evidence, from fingerprints to tracks to trash! Recreate the scene of a crime using clues and detailed observations. Become a super sleuth and learn clever ways of performing tasks in this hands-on view of the science that spies use. From decoding messages to metal detectors and night vision, campers will have the opportunity to check out spy equipment and discover the technological tools of detection. The “Med School 4 Teens” Camp is tailored for pre-teen/teenage students with an interest in human biological sciences, or may wish to explore the possibility of a career in one of the medical professions in the future. The many topics students will learn about in this program include blood, heart, digestion, joints, and skin – the normal and abnormal conditions in each of those systems, to name just a few, In addition to many fun experiments during the camp that help to explain how various bodily systems work, students will get an overview of techniques such as electrocardiography placement, hernia repair, vascular surgery, and Electrocardiogram through hands-on experiences, and will also make a skin model reflecting normal skin as well as common skin problems, and a brain model, to take home. This program promises to be challenging and rewarding, and students will finish the week having learned many medical vocabularies. The camp ends with a graduation ceremony where parents are welcomed to attend. This camp will offer a review of Middle School Math concepts and relevant course work in order to prepare students for their best success in Middle School level math. A review of the basics makes for an easier transition into the next level! Content focus will be individualized to best meet the needs of each participant. Create an interactive mobile game that uses a smartphone's gyroscope to control characters through mazes and obstacles to find the goal! This camp focuses on the unique advantages of the mobile platform for development, teaches participants modern approaches in game design, and uses haptic and SFX feedback to enhance the game's feel. Students walk away with a robust mobile app that can be exported to a native app and downloaded by others. Camper-created apps will be accessible post camp and can be played on any computer or mobile device. No prior experience is required. We provide all technology on location. Principles of Neural Science- (9-12) We are looking for high school student with a genuine passion for science and interested in scientific investigation. In this camp will discuss in detail the organization of the nervous system and how it interacts with the muscular system, how action potentials are produced and propagated, and how movement is produced. Camp days will consist of lectures and laboratory explorations. We will record action potentials in muscle, learn how fast your brain respond to stimuli, why muscles fatigue and the importance of muscle recruitment. Camp taught by Dr. Gendreau, HRA Upper School Faculty. Dr. Gendreau has a Masters in Biobehavioral Science and a Ph.D in Neuroscience from the University of Connecticut. She has published her work on auditory pathways in several scientific journals. She has taught Biology and Anatomy and Physiology at HRA for the past 11 years and has guided several students through independent studies in science as well as summer internship opportunities in the scientific field. Develop your problem solving and creative thinking skills while exploring the creative side of math. Focus will be on one interesting math topic a day while creating an art project related to the math. Topics could include: binary numbers, randomness, Fibonacci, fractals, 3-D geometry, Pascal's Triangle, and more. The “Best of Little Medical School” Camp is newly incorporated through the experience of Little Medical School instructors, who have observed what activities most captivated elementary school-aged students in the past. This program highlights the most exciting and interesting activities in the Little Medical School curriculum, and promises to be a fun-filled camp! As always, the goal of Little Medical School programs is to introduce young students to medicine, science, and the importance of health in an exciting and entertaining way. Besides learning to use the stethoscope, reflex hammer, blood pressure cuff, mortar and pestle, and syringe, students will also experiment with surgery technique as well as role-playing a surgical scene! They will also learn about nutrition and how to read food labels, as well as role-playing the digestive system, to name just a few of the most exciting activities! Each student will take home a real, working stethoscope and a no-needle syringe, in addition to other related materials. Students who successfully complete the program will be granted a graduation diploma, which they will receive during a graduation ceremony on the last day of the camp where parents or guardians are welcome to attend. Discover the fun of learning science! If you've experienced this camp before, there are some new twists this year . . . Students will be engaged in scientific explorations that are so much fun they will forget they are learning! Students will have the opportunity to explore different realms of science such as biology, physics and chemistry. They will be engaged in exciting hands-on activities, watch spectacular demonstrations, participate in inquiry-based discussions and take home things that they have made themselves. Fun and engaging experiments will make them think and love the amazing world of science! Participants will review their last course's skills and receive introductory skills for their 2018-19 math course. Skills will be specific to each participant. If the participant was required to complete a summer mathematics assignment, they can bring it in. Participants will also learn some additional graphing calculator skills, so bring your TI-84 series graphing calculator. If time allows participants will also work some SAT and/or ACT math problems. This is NOT a SAT or ACT test prep course. Morning activities will follow the weekly theme with indoor/outdoor games and crafts. Afternoon activities can include - park, beach, pool, bounce house, bowling, mini golf, snow cones and more. Morning activities will follow the weekly theme with indoor/outdoor games and crafts. Afternoon activities can include - park, beach, pool, bounce house, mini golf, snow cones and more. Kick off the summer at HRA. Games, sports, crafts and team building will get your camper ready for an awesome summer. Come and explore animals of all kinds and from all countries. We may even fit in a trip to the Norfolk Zoo. Music Mania! Music and more is what this week is all about. Students are encouraged to bring in anything musical and we will play and sing all week long. Karaoke is a must! Super Sleuths! Ever wanted to go undercover? Come this week and explore all the adventures of the Super Sleuths. This week we will celebrate the USA. Play baseball, make flags and more and even make mini apple pies. Campers explore their creative and silly side by discovering and developing their carnival/circus and performing arts skills. We will make carnival games and play to earn points for prizes! Circus arts taught include juggling, balloon twisting, plate spinning, clowning, face painting, magic tricks and more! Be ready for the Cotton Candy Machine on Friday. 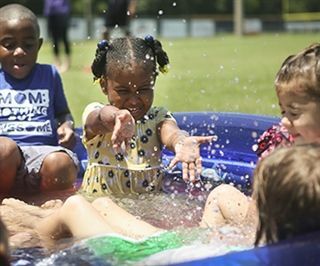 This week is packed with water fun! There will be water balloons, relay races and even a cardboard boat race. A Trip to the beach may also happen! Pack your bags and grab your passports. We are off on a new adventure each day learning about different cultures/countries through games, music, foods and crafts. This week will be messy and lots of fun. Spend the week playing soccer, football, baseball, dodgeball, and more. We will close out the summer with our favorites from weeks gone by.